There’s no vehicle out there quite like the Jeep Wrangler. This open-air 4×4 offers what no other off-road machine does—removable doors and top, on and off-road 4-wheel disc antilock brakes, and a style that’s classic Jeep combined with interior amenities. The 2017 Jeep Wrangler Colorado Springs, CO is ready to be your next Jeep. Available in 10 different models, the Wrangler features 5 Limited Edition trims to suit any Jeep-lover’s taste. With upgraded features for 2017 featuring classic Jeep styling, you’re going to love what the Wrangler offers in all these models. The Jeep Wrangler is an unmistakable icon that makes off-roading that much more fun. Safer with advanced control features and luxury interior touches, the Wrangler embodies everything you love about Jeep. From the power dome hood to the Sunrider soft top, you’ll love the Wrangler for 2017. The Willys Wheeler offers an additional W option which comes in—like the Freedom Limited Edition—Chief and Gobi colors that aren’t available in the other models. Optional LED lighting group with an optional Dual Top means you get the Freedom Top black and 3-piece hard top. The fog lamps and reflector headlamps come with a rear window defroster. A tinted rear cab and liftgate means your items are safe from wandering eyes. The 17-inch high-gloss black wheels provide sharp style. The rear folding seat and available Power Convenience Group bumps the Willys Wheeler W one step up from its counterpart. This package features power windows, door locks, remote keyless entry, a security alarm, and heated power exterior mirrors. Inspired by what many call the Father of Recreational Vehicles, this Wrangler takes its design after the original Willys CJ. The off-roading components with classic Wrangler styling make this Limited Edition a truly special Jeep for 2017. The Willys badging and road kit with the hood decal define the exterior of this Jeep. Available half-metal doors make your open-air experience customizable from no doors to half doors to full top. The Trac-Lok rear differential and Command-Trac 4×4 give you options for mastering your terrain. Deep tint sunscreen windows ensure your skin is protected while riding the trails. The standard Jeep Trail Rated kit and rock rails make this Jeep more capable than ever. Coming with a standard 6-speed manual and option for a 5-speed automatic gives you choices. No matter which option you choose, enjoy performance suspension in the Willys Wheeler with Hill Start Assist and Hill Descent Control. With performance suspension and Rock-Trac 4×4, the Rubicon also features Tru-Lok electronic locking differentials. 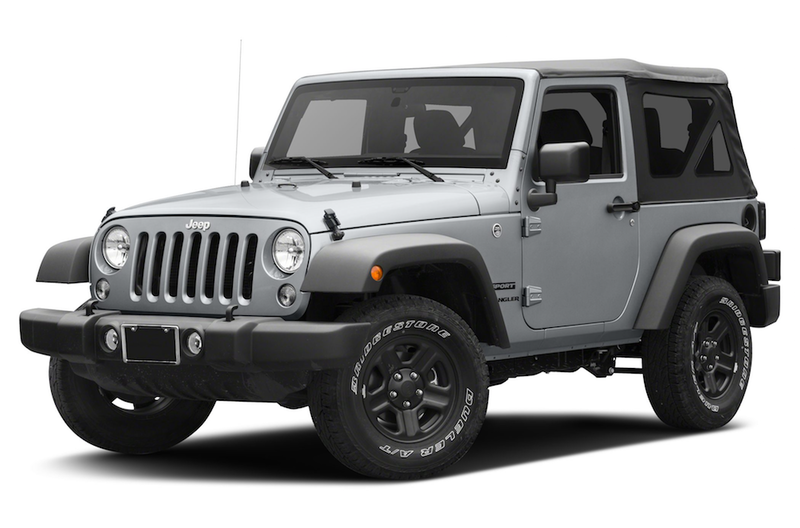 With standard LED fog lamps and 8 speakers, the Rubicon could be your next Wrangler for 2017. 17-inch polished mineral grey aluminum wheels are exclusive to the Rubicon. With optional leather-trimmed bucket seats, the interior is ready to impress. There’s also a standard 115-volt auxiliary power outlet for your convenience. Red tow hooks and speed control help the Rubicon perform to your standards along with Trailer Sway Damping. Standard multi-stage front airbags and available supplemental side airbags with sensor detection help keep you and your passengers safe in the Wrangler Rubicon. The Rubicon Hard Rock sports more off-roading features with a sophisticated interior for comfort. With 285 horsepower and 260 lb.-ft. of torque, the Hard Rock Limited Edition is everything you love about the Rubicon with a bit more punch in a stylish Limited Edition model. Tru-Lok locking differentials enable you to have more control while tackling off-road terrain. This includes locking the front and rear axles, all from the dashboard. Rock-Track 4×4 means you have more Trail Rated fun while still being totally in control off-road. The Rubicon Hard Rock Limited Edition for 2017 also features an Alpine audio system with 9 speakers and standard heated front seats. Auto dimming mirrors and silver interior accents add a touch of flare to the Rubicon. The cargo compartment floor mat and semi-gloss black wheels make this Jeep all accessible with an uncompromising design. The Winter 2017 Wrangler is ready for snow, sleet, and ice. This Jeep lets you choose from colors like Alpine, Chief, and Bright White with 17-inch black wheels. The heated leather-trimmed seats ensure you’re cozy while your Jeep takes on the elements. With off-road rock rails and BF Goodrich KO2 tires, the Winter Wrangler is ready for just about anything. This Jeep also has off-road steel bumpers and the Winter Edition package. A next-generation Dana 44 solid front axle with a Trac-Lok differential rear axle is paired with heavy duty suspension. Standard leather seating with cloth sport mesh allows comfort, while a rear folding seat and easy access to the passenger seat makes for innovative storage. A full-size spare tire in the back with a front and rear stabilizer bar further complements this Limited Edition 2017 Wrangler. The interior of the Sahara Wrangler comes in black with dark saddle and black with dark olive. These interior colors are almost as impressive as the exterior, which features a heavy duty suspension and a Command-Trac 4×4 system. With body-color fender flares and 18-inch polished aluminum wheels with Granite Crystal Pockets, you’re ready to tear up some turf in the Sahara. The body-color fenders are enhanced by a body-color grille with silver metallic accents and a black front bumper. Traction control and a front stabilizer bar helps the Sahara tackle more while keeping your interior shielded from vibration and noise. The interior of the Sahara also features embroidered seats and a leather-wrapped steering wheel. A 430N radio makes the multimedia center the hub of your Sahara Wrangler. The Freedom Limited Edition Wrangler honors our armed forces with its design and abilities. It comes in inspiring colors like Chief to the more reserved Gobi. The patriotic exterior Freedom Edition decals and badges make this one unmistakably stylish and capable Wrangler for 2017. With Command-Trac 4×4 and a 3.6L Pentastar V6 engine, the Freedom Limited Edition adds interior and safety benefits to its capabilities. With a lockable center console and the standard Connectivity Group from Jeep, the Freedom includes tire pressure monitoring and Uconnect voice command with Bluetooth. The Freedom Limited Edition has standard rear-folding seats with power heated mirrors for your convenience. A security alarm helps you keep all your things safe in the Wrangler. With McKinley leather-trimmed seats and a premium soft top, the Freedom goes wherever your heart desires in comfort. 18-inch mid-gloss Granite Crystal wheels compliment your exterior color choice. The Freedom Limited Edition features a standard 115-volt power outlet with a remote USB port for accessibility and capability. Although the badging and decals are one of the best things about the Freedom, Jeep gives us plenty of interior and exterior features to admire. The Sport Wrangler has your classic wash-out exterior with skid plates and an optional Black Appearance Group by Mopar. This includes the black fuel filler door and black tubular side steps. Standard cloth seats with adjustable head restraints offer comfort as well as accessibility in the Sport. The standard black Sunrider soft top is easy to use and also quiet and watertight. It blocks out noise and helps reduce the sound in the cab so all you enjoy is protection from the elements or sunshine, depending on what you’d love to do that day. The Sport S Wrangler combines power and style to be your ultimate Jeep for 2017. The chrome and leather-wrapped shift knob and leather-wrapped steering wheel create luxury in the Wrangler Sport S.
17-inch MOAB cast aluminum wheels come with an optional Chrome Edition group by Mopar. This includes a chrome fuel filler door with a chrome exhaust tip and tail lamp guards with tubular side steps. Optional all-weather slush mats by Mopar make for all-weather fun in the Sport S.